Some people buy lottery tickets every week and sit by the phone waiting for Arela to call. I didn’t buy any ticket but I got the call anyway. Or so it seemed. In fact, it was even better. Better than winning the lottery. 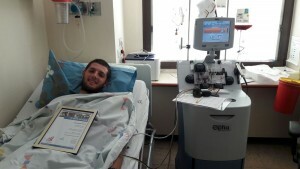 I got a call saying I was the only one in the world that can save the life of a thirteen-year-old boy with leukemia. Can you imagine what that felt like? Saving a life. That’s the ultimate in goodness, in honor. And it was awarded to me! My name is Yair Moznon. I am 21 and from the Otniel Hesder Yeshiva. After the call, the procedure was explained to me. First came deeper genetic testing. They warned me that this testing may show that I am not as good a match as they wished so I wouldn’t get my hopes up but, as it turned out, I was a great match for this boy. We weren’t allowed to meet but I felt very close to him as we both prepared for the transplant. I was given injections that stimulated the production of stem cells while he underwent a strong chemo treatment. I can’t believe that a 13-year-old kid has to go through this. Then came the big day. My blood was taken from me, the stem cells removed and the blood returned to me. 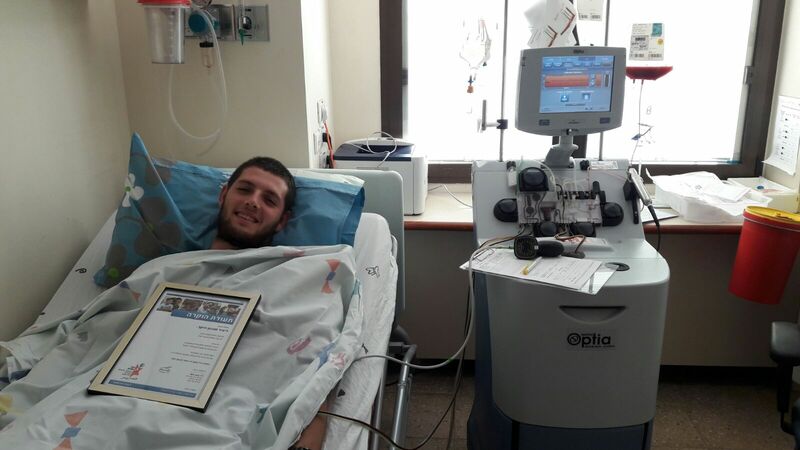 The procedure was repeated until there was enough stem cells for the transplant. I would have loved to hug him as my cells were going through his body, giving over my wishes and prayers into his being, but we aren’t allowed to meet for a year. Every registry has to follow those rules. And so I pray for him every day that my cells will cure him and allow him to grow up like every other boy his age. In a year we’ll meet and I look forward to it like I’ve never looked forward to anything in my life. It’ll be like having a younger brother, a brother that I never met.